Check the fluid level in the reservoir periodically. The fluid level should be between MAX and MIN marks on the side of the reservoir. Before removing the reservoir cap and adding brake/clutch fluid, clean the area around the reservoir cap thoroughly to prevent brake/clutch fluid contamination. If the level is low, add fluid to the MAX level. The level will fall with accumulated mileage. This is a normal condition associated with the wear of the brake linings. If the fluid level is excessively low, have the brake system or clutch (if equipped) checked by an authorized HYUNDAI dealer. Never mix different types of fluid. In the event the brake system requires frequent additions of fluid, the vehicle should be inspected by an authorized HYUNDAI dealer. When changing and adding brake fluid, handle it carefully. Do not let it come in contact with your eyes. 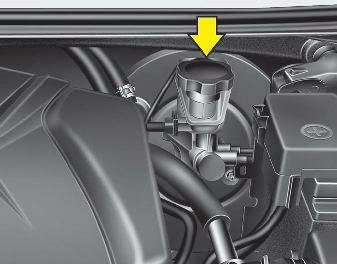 If brake fluid should come in contact with your eyes, immediately flush them with a large quantity of fresh tap water. Have your eyes examined by a doctor as soon as possible. Do not allow brake fluid to contact the vehicle's body paint, as paint damage will result. Brake fluid, which has been exposed to open air for an extended time should never be used as its quality cannot be guaranteed. It should be disposed of properly. Don't put in the wrong kind of fluid. A few drops of mineral- based oil, such as engine oil, in your brake system can damage brake system parts. © 2019 www.hyundaielantramanual.com. All Rights Reserved.